Do you want to learn how to start a blog and build it to a point where it can provide a nice second income and build a nice buffer for your bank account? Are you lost when it comes to figuring out which blog engine to use, or what ways are the best to monetize your site? You're in the right place! Buy the ebook package now below, or read on for more details! 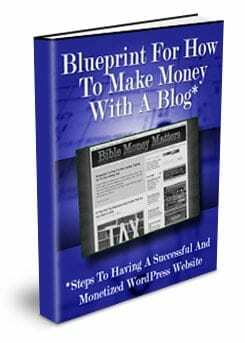 I wrote the “Blueprint For How To Make Money With A Blog” e-book in order to show others how I was able to turn my small insignificant site into a highly monetized profit center for my family. If you follow the directions in this e-book you'll give yourself a much better chance of succeeding as well. Starting a blog is no easy task, and if you're doing it on your own, you'll need to learn through trial and error. I know I made tons of mistakes along the way, mistakes that could have been avoided if I had only had someone giving me the information included in this e-book. This e-book is written with the express purpose of helping to shorten the blog learning curve. I am giving you the inside information that you need in order to make your blog succeed, and help your site to become a virtual money printing press. This package is so much more than just an e-book, however. We're including a whole blog success package, with all the tools you'll need to get your blog up and running, and bringing in revenue. Imagine having someone who has grown a successful money making blog become your personal consultant to help walk you through creating your own income producing venture. How much would you expect to pay for that? $200? $500? Thousands of dollars? I know some blog courses do in fact charge thousands of dollars. Buy this ebook success package today and you'll get all the information you need to setup your own money making blog not for thousands of dollars, but for the value price of only $19.95. You'll make that back in a day or two! Still not sure that this e-book is for you? We wouldn't expect you to purchase this e-book and blog success package without first getting a peek under the hood. Here's a preview of some of the rich content that you'll find in the “Blueprint For How To Make Money With A Blog” e-book. Section 2: What Is A Blog? Section 3: What Blogging Software Should I Use? Section 15: How Long Does it Take To Start Making Money With A Blog? For a limited time you can get a bonus report that will give you priceless blogging advice from 17 successful bloggers. We solicited money making tips from the bloggers behind wallethacks.com, freemoneyfinance.com, frugaldad.com, robsutton.com, christianpf.com, wisebread.com, consumerismcommentary.com, erica.biz, moneyning.com, cashmoneylife.com, goodfinancialcents.com, mytwodollars.com, mydollarplan.com and others! They responded with their best tips and tricks for having a successful money making blog. There's a lot of great information in this bonus report! Get it now while we're still offering it! It would take you months to learn all that's been included in this e-book and bonus material. Save yourself some time and get the blueprint. It's worth the price for the 2 checklists alone! If you want to make money from a blog this is a must read. Period. Follow this advice and you will be well on your way to earning from your blog! I highly recommend the “Blueprint For How To Make Money With A Blog” ebook. This ebook covers all the information you need to know to get a blog started, including the topic, software, domain name and hosting. There are a lot of great suggestions for making money including explaining the different types of ads as well as how to write content that is more likely to make money. Is your blog earning pennies a day? Stop complaining and get this eBook. If you value your time you'll invest the money and save HOURS of your time. This eBook will give you the tactics needed to grow your blog. No information overload. No BS. So stop reading “get rich quick blogging” books, pay the small cost, and let the magic begin! The information in this e-book is not only deep, but it's broad too. Getting your blog off the ground with “Starting a Blog Checklist”, it dives deeper with daily, weekly, and monthly checklists to insure your blog is consistently on the right track. Consistency is one of the hallmarks of a great blog and that's your goal, you have two choices: 1. Find out eventually that everything in this e-book is true (trial and error = 2+ years) 2. Buy the e-book and learn the secrets to blogging success (e-book = happiness today). The e-book delves into areas such as advertising, promotion, search engine optimization, and which tools will help your blog grow beyond your wildest dreams. I wholeheartedly recommend this e-book! I would consider myself at least an intermediate level blogger and I keep finding new nuggets of wisdom in this e-book. If you want a no nonsense how-to guide on supercharging your blog this is it. Not just mamby pamby fluffy stuff but honest technical tips and solid advice. Finally some incredibly practical and useful advice from someone who is actually doing it. Worth every penny. Highly recommended! Peter has created a guide that bloggers at any level can utilize to better dominate their niche. Whether you are learning how to use WordPress or have been blogging for years, this guide will make you a better blogger. I wish I had this guide when I started blogging over two years ago. Peter gives a great nuts and bolt overview in this book of what you need to get your blog off the ground and headed for profitability. After you buy the ebook you'll notice that he points you to some valuable resources at the end of most modules. Not only is Peter sharing what's worked well for his own blog and niche; he's also incorporated the wisdom of great bloggers like Brian Clark (CopyBlogger.com) and Darren Rowse (ProBlogger.net). Be sure to check out the sections on ad targeting and optimization starting on page 32, those can really make a difference for your blog! I wish I had the tips in this e-book when I started out. It took me a long time to gather most of this information myself and a LOT of mistakes on my part. Peter is giving this advice to you all at once! If I could go back in time with this e-book to when I started I'd be paying off my cars with my site income (if not more)! I've known Peter and his site, Bible Money Matters, going back to around when he started. He's always been a stand-up guy ready to help out a reader or fellow blogger. Now he's giving out some of the best tips out there for practically nothing. Do yourself a favor and give his Blueprint for How to Make Money With a Blog a read. The Daily Blog Tasklist alone is priceless!! Peter's book is full of nuggets. Just the daily/weekly/monthly blog checklists alone are worth their weight in gold. Blueprint for How to Make Money with a Blog has turned out to be an even more helpful of a resource than I could have ever imagined. Recently, I experienced some web hosting issues with my blog, One Money Design. At a loss for how to identify the problem and not getting much help from the current web host, I made a quick decision to move to a new host. Pete’s instructions from identifying a web host, setting up your domain name to point to a new host and other instructions provided me the information I needed to get the job done! I even used Pete’s webhost and the coupon from the ebook. I couldn’t be happier with my decision. I’m pleased with the support from my new host, my issue is resolved and my blog’s performance has improved greatly! The e-book is full of excellent instruction and tips to run a professional blog. I highly recommend it. 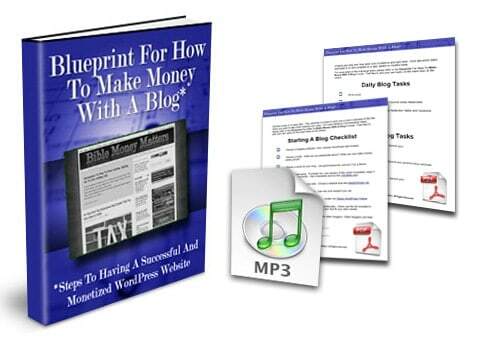 Blueprint For How To Make Money With A Blog E-book. The e-book is 35 pages long and contains 14,000+ words. Step by step instructions on creating a money making blog. Everything from choosing a name and domain name, to pointers for writing great content and monetizing your site. You'll find tips and tricks that can help you avoid so many of the frustrations that so many have when starting their sites. Audio Version Of The E-book: Listen to the e-book .mp3 on your Ipod! Strategize on how to create your money making blog while you drive to and from work! Printable “Start A Blog Checklist”: Included is a printable .pdf checklist of tasks that you'll need to perform to get your blog up and running, and on the road towards making an income. Check them off as you complete them! Printable “Daily, Weekly & Monthly Blog Tasks Checklist”: Once you're up and running you'll need to execute daily actions to keep your site growing, and to get the income trending up. This .pdf checklist will be a daily reminder of the tasks you need to perform on a daily, weekly and monthly basis. 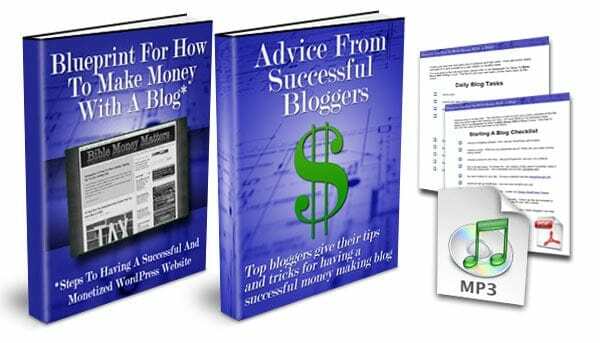 Free Limited Time Bonus – Advice From Successful Bloggers E-Book: I solicited advice on making money with a blog from 17 successful bloggers, and they responded. This content is added as a limited time bonus, so get your e-book now! 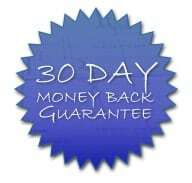 When you order your copy of the “Blueprint For How To Make Money With A Blog” package, we're so confident that you'll love the e-book and other materials that we're offering a 30 day money back guarantee. If for any reason you're not satisifed with your purchase, just contact us within 30 days with your payment information and we'll credit your paypal account. Get the instant digital download now. Pay by PayPal. The price is $19.95. Once payment has been made you will be sent an encrypted download link via email. Click on the link in order to download the .zip file containing all your resources.